Hedley's has 40 years experience transporting antiques around the world our professional team can pack and ship the most fragile of pieces to arrive swiftly and safely. 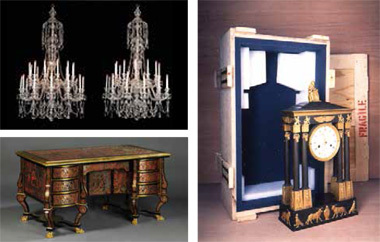 With 40 years experience transporting antiques around the world our professional team can pack and ship the most fragile of pieces to arrive swiftly and safely. Import and export documentation, customs clearance and CITES applications. We service the antique fairs in the South of France and Parma, Italy and make available on-site our export packers, porters and vehicles to ensure your purchases are collected quickly and safely. To assist purchasing we offer our buying book and label system as well as use of our client bank account to help simplify and speed up the process. Our office is located in Marche Paul Bert and our bilingual staff are always pleased to help with any requirements you may have, from transport quotations, calling taxis to language translation.